As the first industry introduced to the New World by Europeans, the fur trade predated Duluth — in fact, it was essentially gone by the time Duluth Township was first established in 1856. From roughly 1550 to 1850, European gentlemen distinguished themselves by donning felt hats made from beaver underfur. Trappers had driven the beaver to extinction throughout western Europe and nearly wiped them out in Russia and Scandinavia by the end of the sixteenth century. So Europeans, particularly the French, set out for the New World in search of more fur. Explorers such as Robert de La Salle, Jean Nicollet, Jacques Marquette, Louis Joliet, Pierre Esprit Radisson, and Sieur des Groseilliers — along with Jesuit missionaries including Jacque Marquette, Claude Jean Allouez, and Louis Hennepin — traveled with French soldiers and native guides throughout the Great Lakes area, mapping the region (which they claimed as New France) and opening trade with the various tribes they encountered. Well established at Saulte Ste. Marie and La Pointe on Madeline Island among the Apostle Islands, the Ojibwe became natural trading partners with the French, who called Lake Superior Lac Tracey after the Marquis Prouville de Tracy, governor of New France. Wars between the Dakota and Ojibwe complicated trade. 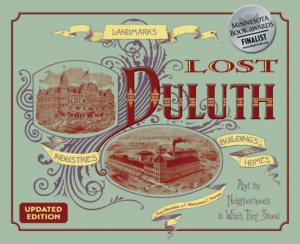 That’s how Duluth’s namesake, Daniel Greysolon Sieur DuLhut, first entered the picture. Born in Saint-Germain-Laval, France, DuLhut was stationed in Montreal in 1678 when he set out to the head of the lakes in part to establish peace among the tribes who lived on the shores of Lake Superior. In 1679 his party landed at Onigamiinsing (“Little Portage”) on Minnesota Point — an Ojibwe portage later platted as Duluth’s Portage Street and since 1871 the site of Duluth’s ship canal. While DuLhut successfully established peace among the Ojibwe, Dakota, Cree, and Assiniboin peoples, it was short lived. Beside the Ojibwe, French coureur des bois — independent agents licensed by France — were also trapping fur-bearing animals. Those coureur des bois who traveled by canoe became known as voyageurs. These independent agents would later go to work for France’s North West Company. Grand Portage, on the Lake Superior shore near today’s U.S.-Canada border, became a major trading center. The British, who still controlled the American colonies at the time, also entered the fur trade. The competition between the two nations came to a head when Europe’s Seven Years War spilled over to North America as the French and Indian War, which lasted from 1754 to 1763. Trade was complicated by the war, and the French and British continued to clash after the war ended, with voyageurs of the French-controlled North West Company competing with the British-run Hudson’s Bay Company to see who could send home the most hat-making material. The War of Independence established the United States of America and changed the fur trade. In the 1780s the North West Company established Fort St. Louis at the mouth of the St. Louis River at what is now Superior, Wisconsin; the post became the region’s center of trade. In 1809 German immigrant John Jacob Astor — said to be the world’s first millionaire — formed the American Fur Company. Two years later Astor’s company joined with the North West Company to form the South West Company, which controlled trapping along Wisconsin’s south shore of Lake Superior west to Fond du Lac. The War of 1812 put an end to all that: the post-war American Congress barred foreigners from trading in American territory in 1816. And so that year Astor purchased the holdings of the South West Company. That same year his American Fur Company began building a new fort at Fond du Lac, where the Ojibwe had established themselves by 1770, and abandoned Fort St. Louis when the new structure was complete. Thomas Douglas, a British earl and principal of the North West Company, occupied Fort St. Louis after Astor’s men pulled out, but abandoned it in 1817 because of the prohibition on foreign traders. It is not clear when Fort St. Louis was ultimately destroyed. Astor’s facility at Fond du Lac, managed by William Morrison, included a two-story log building, a granary, ice house, stable, a dormitory for traders, and the post commander’s house. The fort was surrounded by a cedar-post fence. It faced the St. Louis River near today’s 133rd Avenue West. An Ojibwe village stood on an island directly across from the post. The outpost became a center of trade and a natural spot for gatherings. In 1826 Michigan territorial governor William Cass and Colonel Thomas L. McKenney, the head of the newly formed United States Indian Department, gathered native leaders from throughout the region at Fond du Lac to ratify a treaty designed to both stop fighting among the Ojibwe, Dakota, and other tribes as well as to establish U.S. dominance in the region. 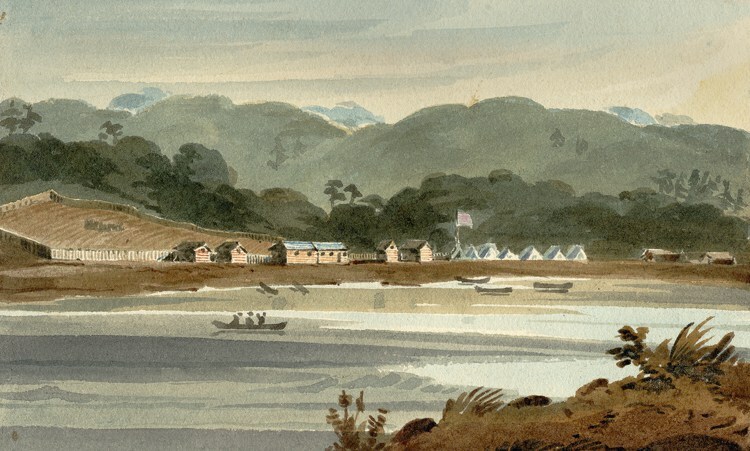 Artist James Otto Lewis traveled with McKinney to Fond du Lac and painted watercolors of both the treaty signing and Astor’s fur post. Unfortunately for Astor, the fur trade declined steeply just five years later. The 1830s saw the fur post turn to commercial fishing to bolster its profits. Astor’s charter expired in 1833, leaving trader Ramsay Crooks in charge of the post. At this same time Protestant missionaries like Edmund Ely came to the region. Ely helped establish a mission and taught grammar and arithmetic to the native and mixed-race children who lived near the fort. Ely also worked on converting locals to Christianity and set to work on a Chippewa language dictionary. But economic realities continued to hinder population growth: A financial panic in 1837 coincided with the increased popularity of silk hats in Europe, and the European fur trade came to a screeching halt. The fisheries operated by the fur company saw bountiful harvests, but had few customers. The company failed in 1842, the fur post ceased operating by 1847, and the mission closed its doors in 1849. The post was abandoned and soon fell into decay, leaving behind ruins which were destroyed in about 1900. In the 1930s a replica of the trading post was built in nearby Chamber’s Grove Park. Created as a tourist attraction, it was much smaller than the original post and its popularity was short-lived. The long-neglected reconstruction was demolished in 1968. The actual fur post site was set aside as Astor Park, recently renamed Historical Park.